The CIA continues to withhold information on its involvement in the Sept. 11, 1973 coup that led to the death of President Salvador Allende in Chile, followed by a deadly dictatorship, according to documents posted Friday by the National Security Archive. In the list of published documents, the section regarding Chile is censored. The President’s Daily Briefs, the intelligence reports given daily to the U.S. president, in particular former President Richard Nixon days before Allende’s death, were among those censored. According to Peter Kornbluh, director of the Archive’s Chile Documentation Project, censorship on this issue makes no sense since the intelligence agency has officially acknowledged its ties to those who plotted the coup from inside the Chilean military, and declassified several intelligence reports since. According to the documents, three days before the coup—and on the day of the coup—the CIA gave Nixon an intelligence report on the progress of the efforts inside the Chilean military to overthrow Allende, a socialist. The same sources told the CIA that General Augusto Pinochet, who would later become a dictator with the support of the U.S., was in communication with Air Force General Gustavo Leigh about the planned coup. The Air Force would later bomb La Moneda presidential palace, where Allende and his closest allies were on Sept. 11. 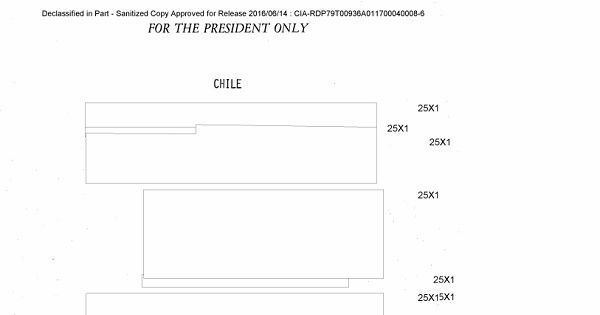 The CIA told the White House that a “key officer” in the coup attempt requested U.S. assistance in case the Chilean military encountered any resistance, according to the documents. Kornbluh said his institution would press for the release of the censored information. “The documents provided to Richard Nixon on Chile can and should be released for the sanctity of the historical record. The public has a right to know what the President knew, and when he knew it,” he said.